We left our hostel at 8am heading to the Plaza de Armas to get a good look at the costumed paraders as they started. The parade had already begun by the time we got down to the square but we needn’t have worried that we missed too much as it turned out that the parade lasted all day and most of the night. 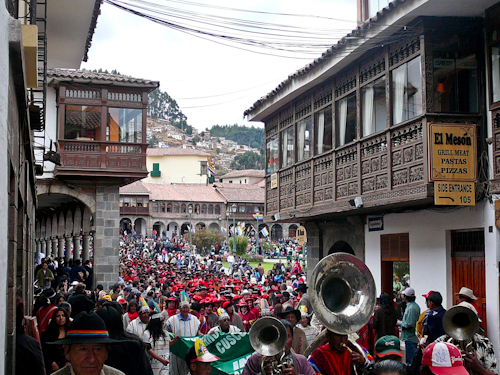 One by one, groups of colorfully adorned Peruvians and their small bands paraded around the square passing by the judging panel before turning the corner out into the surrounding streets where they marched out to find a picnic spot in surrounding city squares. Here they would merrily set up their small grills, pull out crates of beer and proceed to have a party in honor of the great sun god. Hour and hour after hour after hour this went on; thousands and thousands of paraders made their way around the Plaza and into the streets beyond. The city was soon filled with joy, happiness and drunk Peruvians and still the parade was not over. They paraded well into the night; long after I had gone to bed I could still hear the parade marshall on his bullhorn. I would guess it was well over 16 hours when I finally fell asleep but they were still not finished. Truly the worlds longest parade! Don’t want to carry contacts or glasses with you around the world? Consider laser eye surgery before you leave. ← I Want To ‘Go With Oh’ To Venice! I’m headed there in September (after 10 days in Galapagos) to hike the Inca Trail and see Machu Picchu. I can’t wait!!! Did you happen to hike the Inca Trail while you were there? How did the altitude affect you? I’ll only have 1 1/2 days in Cuzco before I start the hike and I’m a bit nervous. What a trip Pamela! Hiking the Inca Trail remains one of the top experiences I’ve ever had. It was amazing to be out in the Andes surrounded by such beauty and history. The altitude is definitely noticeable, I won’t lie, but if you take it slowly you will be fine. Jason suffered way more than I did – we got some ‘soroji’ (or ‘sorochi’) pills from the pharmacy (a mix of aspirin and caffeine) – they helped a lot with the headache and slight nausea. Good luck and have a fabulous trip! The festivals always seem to go on forever, and while I was living there incredibly enough one morning I slept through one that passed right by my window!